The Gambia is the smallest country in mainland Africa, and although it has been both peaceful and stable for more than a decade, it remains one of the world's poorest countries. An estimated 59 percent of the Gambian population survives below the poverty line, living on less than one dollar a day, and the country is ranked 155 out of 177 in the United National Human Development Index 2005. 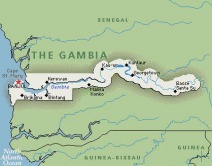 Gambia is situated on the west coast of Africa, and apart from a narrow strip of Atlantic coastline, it is surrounded on all sides by Senegal. It has a narrow and distinctive shape - although it is around 200 miles long from east to west, it is barely 30 miles across from north to south. The port city of Banjul is the capital, and Serrekunda by far the largest city. Gambia has no important minerals or other natural resources and a limited agricultural base which is vulnerable to drought and locusts. Up to 80% of the population depends on crops and livestock for a livelihood. There is some small–scale manufacturing activity, but it is tourism that is the country’s second largest employer and main foreign exchange earner. A variety of ethnic groups live side by side in The Gambia while preserving individual languages and traditions. The main ethnic groups are the Mandinka (also known as Mandingo or Malinke), Fula, and Wolof. The great majority of the people are Muslims, and English is the official language (although each ethnic group has its own language). Primary education in The Gambia is free, but many families struggle to provide the basic uniform and equipment required to allow their children to go to school. In the 2000 school year, 156,800 children were enrolled in primary school (85 percent), while 56,200 were enrolled in a secondary school (34 percent). There is little or no Government support for nursery or pre-school education, resulting in patchy provision across the country.